In a few hours we celebrate the New Year which God appointed for the Jewish people in Exodus 12:1-2. 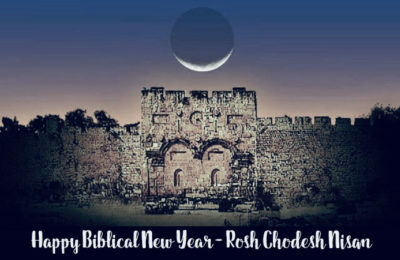 The new moon (Rosh Chodesh) celebration associated with the new year is sometimes called Rosh Chodeshim, stressing its role as the New Month of Months.The name of the first month of the new year is Nisan.The meaning of “Nisan” is unclear, with different streams of rabbinic–and recently, Christian–thought attributing to it very different meanings. Regardless of its technical meaning, Nisan is often and rightly called the month of redemption. It ushers us into Passover, the Crucifixion of Messiah, and His heaven-and-earth shattering Resurrection. It is a month of new beginnings, reflective of the blossoming spring season in which it occurs. This year, a new Israeli government is scheduled to form during the month of Nisan. The national election is four days away, yet many Israelis do not yet know for whom they will vote. While most of the main political parties and potential prime ministers stand for some key biblical values, at the same time, they also stand for some critical values that are clearly anti-biblical. As a result, many Messianic Israelis do not know who to support, despite prayer and fasting, even at this late date. The Israeli intercessors we personally know do agree, however on one matter: God has not shown us His preferred next prime minister. Many times when God is silent on a topic, it is because He has not changed His instruction, mandate or directive since He last spoke on that topic. So one possible explanation for voters’ uncertainty is that God may want Mr. Netanyahu, despite his problems, to stay in office. In many ways he has done a stellar job as prime minister. Perhaps God wants to give him a final opportunity to lead the nation, implement important adjustments, raise up a successor, and surrender more fully to Him. Or, since Israel is a democratic state, God may simply be choosing to let our free will play out—according to His sovereign purposes. Then again, with God being God, His ways are beyond our complete comprehension. We prayerfully walk in the revelation He provides, trusting Him with what we do not understand. A final and key consideration is that most likely, if re-appointed as Prime Minister, Mr. Netanyahu will cooperate with President Trump’s forthcoming peace plan involving relinquishment of covenant land. Most likely, he will again align with ultra-religious, anti-Christian/Messianic gate keeping parties that keep Israeli Jews from the Gospel. And most likely, if Netanyahu accedes to these matters, his coalition will again quickly collapse. In that event, the Israeli public would likely not re-elect him. In a spirit of praise and thanksgiving, pray that God’s sovereign purposes and persons for the next government of Israel unfold, in His sovereign timing. Pray for a government that will be conducive to the spiritual harvest God desires and that we turn to Yeshua as our only true King. Pray protection over the country and political candidates, for righteousness and justice in the election and process of forming a new coalition government. Pray that if Netanyahu’s party wins the election, that he miraculously be able to form a coalition government without ultra-religious, anti-Messiah parties and that he miraculously refuse to give up covenant land to enemies bent on Israel’s destruction. Pray that many more Israeli Messianic Jewish and Arab Christian intercessors arise and stay strong in the gracious power of Holy Spirit. Thank you for standing with us!